Palmetto Bluff, South Carolina is a spectacular community spread over a sprawling 22,000 acres, making it the largest gated community in South Carolina. This private community is exclusive in the sense that as you step into it, it provides you with a feeling of taking you back in time. When you experience the riverfront Wilson Village in Palmetto Bluff, it will give you feeling of a mini Charleston, SC, and transport you a step back into historic ambiance. The Inn at Palmetto Bluff anchors the Wilson Village, and is one of the highlights of the community. The facility was recently brought under new management by Montage Hotels & Resorts. This reputable resort management group has made a slight addition to the Inn's name: The Inn at Palmetto bluff, a Montage Resort. They also have a $100 million dollar expansion plan to add 150 additional rooms, 100 more than the Inn currently has. US News and World Report ranked the Inn as the #1 Best Hotel in America in 2012. You will find the village throbbing with activity at all times of the day. It has a post office, stores, restaurants, and wonderfully built homes that will remind you of some of the most exquisite creations in Old South architecture. Cultural activities are also a part of life at the Village. Situated at the southern-most tip of the South Carolina Lowcountry, Palmetto Bluff community is ensconced amidst a number of islands, labyrinthine rivers, marshes, and maritime forests between Savannah and Charleston. Palmetto Bluff is hardly twenty minutes from the Hilton Head Island, which is recognized as one of the most exclusive oceanfront resort communities in the United States, and it is equally close to Savannah, which houses the biggest historic district in the country. 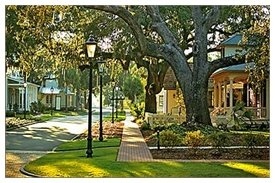 Thus, Palmetto Bluff has convenient access to some of the most pristine beaches and a unique history on the East Coast. If you are looking for an exquisite second home, or planning to move to a new community permanently, Palmetto Bluff, SC makes a wonderful choice in both cases. Once you discover the serene natural setting of the area, you will feel closer to the distinctive spirit of Palmetto Bluff, which will make you want to stay here forever. As you explore this unspoiled paradise of thousands of acres marked with geographical and ecological diversity, the community will overwhelm you with its sheer natural splendors. You can do all of this while you revel in one of the recreational programs designed exclusively for guests and members. Land and water based activities abound in this community. Have the fun of your life with golf, tennis, boating, fishing, kayaking, birding, hiking, creative activities, and more. If, on the other hand, you are looking simply for a quiet opportunity to relax without a schedule, Palmetto Bluff will hold you in its beautiful setting. All you will need to do is sit back and relax, or enjoy the luxury of one of the finest spas in the country. The icing on the cake here is the Jack Nicklaus Signature Golf Course. As you wind past palmettos and thick oaks along the high bluffs of the May River, you can see golfers engrossed in the game in a serene and peaceful setting, with only the heavenly sights and sounds of nature to distract them. Palmetto Bluff boasts some of the most magnificent river front, marsh front, lake front and golf view homes and lots for sale in the Hilton Head area. Each home is the creation of an owner’s dream and a custom architect thus creating a community that delights the visual sense.If you have questions about specific homes or real estate in general, contact us. We're happy to help you find your dream home.